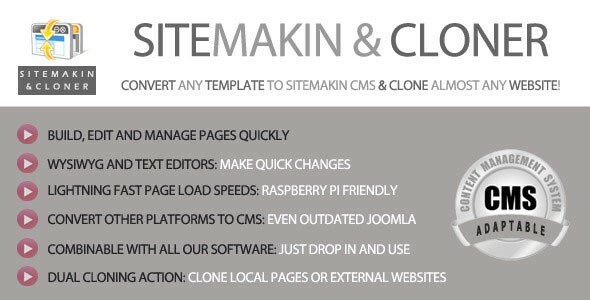 Sitemakin and Cloner v6 - Fast CMS and Cloner - CODELISTPRO | Free Premium Scripts, Plugins, Apps Source Code. Two tools in one; a simple to use CMS and a site cloner that can clone most websites out there. Lightning fast CMS that can use any HTML template as its theme. With two clicks of the mouse, you have an editable page. No programming knowledge required! Alongside the CMS, we have included two cloning tools. One is built to clone the working site into HTML files and the required folders that contain css, images and js. The other tool can be used to clone almost any website on the web and give you a compete set of working files.